In class, we got asked to design a mobile app for either iOS or Android. We could make the app about anything we wanted. I must admit I didn’t really know anything at the beginning but later down the road I read a few guidelines and I actually liked it. I chose Android as the operating system, the reason for that was not only because my phone is Android but because it tends to be more open than iOS and I’m currently more updated as to how the OS works and behaves right now. The last time I used iOS was around the “4” version, so I still remember iOS with all of it’s gradients and skeuomorphism. The idea for the app was pretty simple: You point the camera and the app tells you what color you’re looking at. The app was specifically for mobile users who are colorblind and needed help knowing what color they were looking at. Later though, I decided to open more the targeted users, so I made features that designers (and other people) would also like. So the targeted users are basically: The colorblind, designers and people who just want to make a color combination for their room when painting or any other activity that would require such feature. So why did I chose this particular idea? I had this idea for a really long time now and I am myself a colorblind person. Like I said above, you point the camera and the app tells you what color you’re looking at, but later added that it will also tell you the color values such as RGB, CMYK, Hex and more. I added a screen that automatically matches colors for you depending on the color you were previously looking at. You can also match your own colors by saving each color you want. We all did mock-ups of our apps for the class and in my opinion turned out quite good. The interface for my app it’s quite simple, You start up at the camera then you can swipe right to access settings or swipe left for the color matching screen. 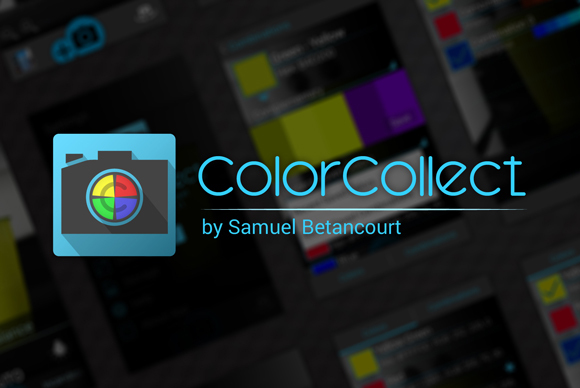 From the color matching screen you can access another screen which has the colors and combinations you have saved in the form of a list. You can see the mock-up here. I would love to hear opinions! Leave them at the comment section below.